There’s no denying that Platinum has certainly taken the corporate world by storm since they exploded onto the scene in 2004. They perform regularly at some of Melbourne’s most prestigious ballrooms and high profile events such as AFL Grandfinal Eve Ball, Melbourne Cup – Flemington, Royal Childrens Hospital Appeal and Beijing Charity Gala at the Shangri-la Beijing’s main ballroom – China. Carols by Candlelight (Ch 9), Dancing with the Stars, It takes two (resident vocalist), The Singing Bee (resident vocalist), The Footy show, Hey Hey its Saturday. Good Morning Australia (regular performer), played ‘Fiona’ on ABC Drama ‘The Damnation of Harvey McCugh’. Resident keyboard player for TV shows; In Melbourne Tonight, Hey Hey its Saturday, The Main Event. Platinum’s musical score spans almost 5 decades. From music that was conceived amidst the social revolution of the 60’s, right through to the electro-retro of the naughties. Their show has genres that every big performance should have – Pop, disco, funk, retro and of course ‘ROCK’. 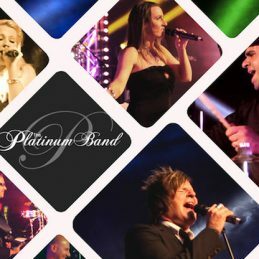 They pay tribute to artists and bands such as Michael Jackson, Madonna, Rogue Traders, Bruno Mars, Katy Perry, Guys Sebastian, Lady Gaga, Olly Murs, Pharrell Williams, Jessie J, Pink, Phil Collins, Robbie Williams, Rolling Stones, Ce Ce Peniston, Aretha Franklin, ACDC, Kylie Minogue, Prince, Robert Palmer, Gloria Gaynor, Tina Turner, Dianna Ross, ABBA and many more….